Looking at the picture above, you’ll notice quite a transformation. What you might not notice at first glance is the large custom garden shed built to fit perfectly under the deck. This was one of the goals of the homeowners and this is one of the benefits of working with a custom design and build contractor. 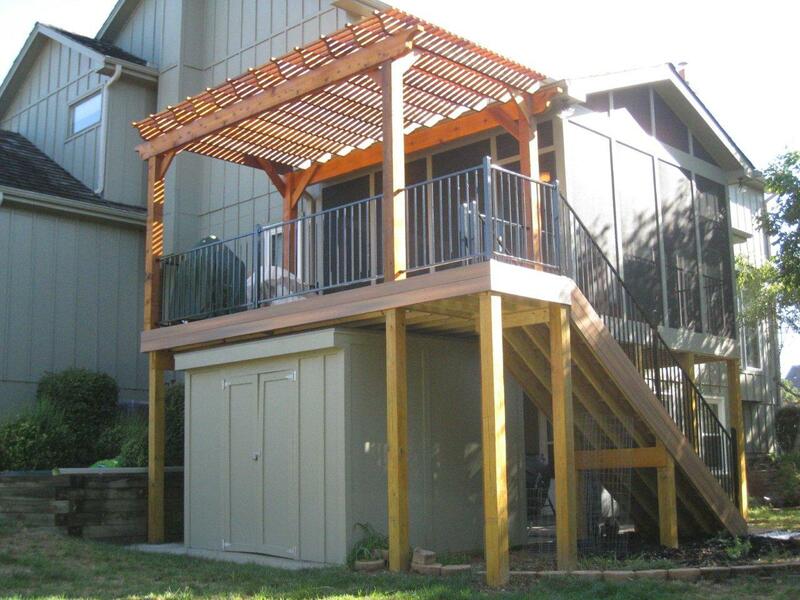 When we first met with these Lenexa KS homeowners, they had an old deck with a garden storage shed off to side. They wanted a screened porch, a larger deck, a pergola over the deck, and a new garden shed designed to fit under the deck. We completely redesigned in size and footprint to include all these elements. In addition to knowing which structures they were looking for, these homeowners also knew they wanted low maintenance materials including composite flooring for and metal railings for strength, durability, and low-maintenance. 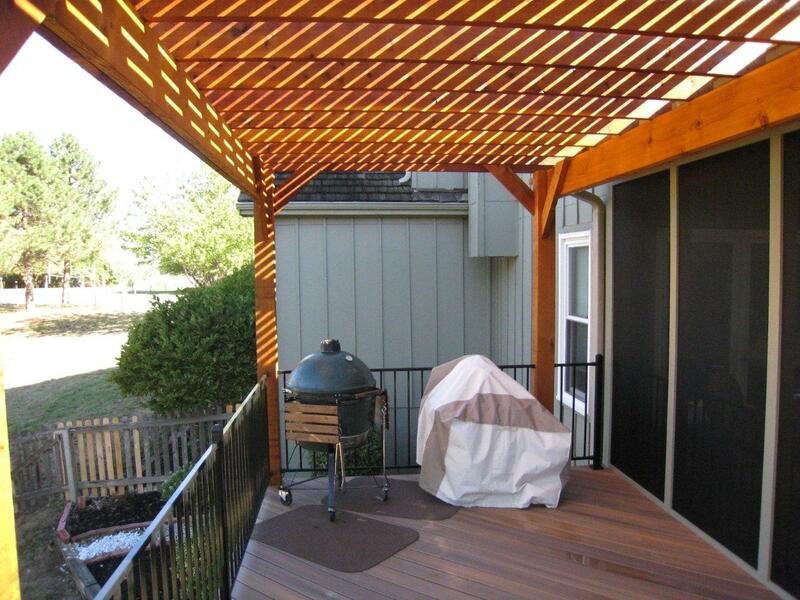 After considerable looking, they selected Fiberon Ipe color as the deck and porch flooring. They selected low-maintenance Fortress iron railings in black for both the deck and porch. 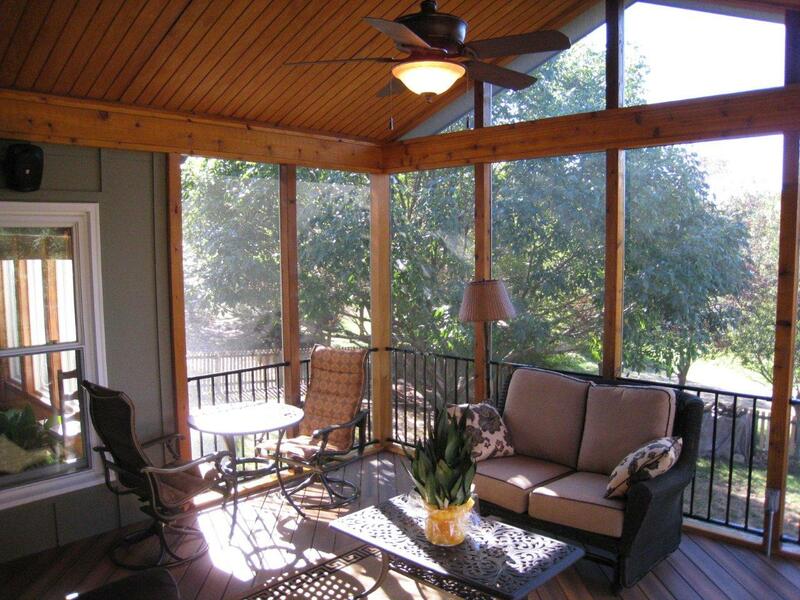 We built a gable roof screened porch for a light and airy feel. The wall posts are cedar and the T-111 ceiling is stained to match the ceiling. They wanted ceiling fans, outlets, etc. which we built into the porch. We used our standard heavy-duty screen. You’ll notice how nicely the black railings allow for visibility. Not only are they slender, but the dark color also moves your eye past the railing. The outside porch is trimmed with low-maintenance smart trim. The deck on the adjacent porch has a cedar pergola over it for shade. Both the deck and stairs are in Fiberon’s Ipe color which has beautiful markings to look like real exotic hardwood. The garden shed is fully waterproof. We custom designed the shed out of Hardie siding and trimmed it with low maintenance Smart Trim. If you are considering adding an outdoor living space, give us a call at (913) 851 – 3325 or send us an email at kansascity@archadeck.net. Our consultation is free. We look forward to your call. This entry was posted in Decks, Fiberon, low maintenance decks, porches, Screen Porches and tagged Archadeck KC, Archadeck of Kansas City, Lenexa KS custom garden shed, Lenexa KS deck, Lenexa KS pergola, Lenexa KS screened porch on September 18, 2012 by archadeckkansascity.